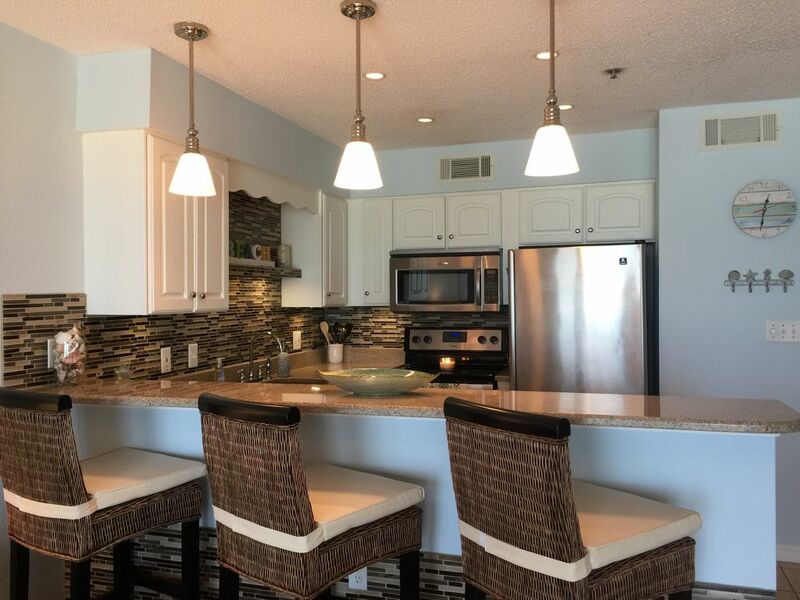 You will absolutely love staying in this remodeled 1 bedroom, 1.5 bath ground floor condo during your vacation in the magical paradise that is Destin! You will be absolutely mesmerized by the beachfront gulf view.... The view is 'to die for', and you can see the emerald green waters of the gulf of Mexico from every angle of the kitchen, living room and balcony! You will walk directly from your patio out the beach! This beautiful home features a totally remodeled kitchen with granite counters, tiled back splash, stainless appliances, new, updated designer comforters and linens and the baths have been upgraded with new granite counters, faucets and fixtures. There are new hd, flat panel tvs, blue ray dvds and free wi fi! This home is perfect for entertaining with family and friends, and the kitchen is fully stocked for all your needs. There is a washer and dryer in the unit for your convenience. This unit is very spacious and sleeps a total of six. The bedding is as follows: king in the master, bunk beds in the hall and the new couch pulls out to a queen size bed. Also, the complex has recently been renovated with a new roof, new railings, new balcony flooring and fresh paint. It looks amazing! Beginning March, 2018 the entire complex will be smoke free. This home is very special! It is bargain priced and is designed for those who want a 'special' vacation! It is located in the crystal beach area of scenic hwy 98, just minutes from Destin commons, the outlet mall, downtown Destin, the harbor and Sandestin! I hope that you will choose to vacation with us sometime very soon! Granite counter, tiled backsplash, new stainless appliances! The Crystal Sands is a wonderful family oriented low density condominium complex! Perfect location, great community. The beach service was an additional bonus! Will most certainly be back! Wonderful Christmas getaway! Weather was beautiful for most of the stay! Great beachside condo with easy access to the pool and ocean! Perfect amount of space for our family of four! Beautifully decorated condo with an even more beautiful gulf-front view! Enjoyed walking right out the door onto the beach and watching the sun rise and set from the patio! Had a wonderful time and would most definitely rent again! Kim, thank you so much! We try hard to provide our guests with a beautiful, clean condo. We look forward to your next trip to paradise! We had a grand experience!! The condo was clean and everything was updated beautifully. Kitchen is just perfect for our little group. The location is perhaps THE BEST I’ve ever scored on a trip. Parking right at the door. Key pad code to lock and unlock the condo was so convenient. Back sliding doors open onto the patio area which puts the white sand and blue gulf waters in panoramic view- seriously stunning! You have access to a rinse station and the wide wooden stairs make it super easy to get down to the water. Just overall spectacular spot! There is a patio table and chairs perfect for coffee drinking and morning reflections or wine drinking and evening laughs. We had plenty of both! The owner was quick to reply when I had a question and didn’t get frustrated when she had to email me the agreement more than once because even tho I’m a very good tenant, I can’t seem to keep up with an opened email. :) she was great to work with. Linens were soft, beds were comfy, plenty of towels and also the washer and dryer made life so much easier! Pack fewer clothes and wash what you need. So easy!!! Amber, what an outstanding review! Thank you so much! The owner was quick to respond and very helpful. The condo was clean and comfortable. We loved staying right on the beach and really enjoyed our beach service too. Lisa, thanks so much for the great review. Great location! The view is amazing! Close to restaurants and shopping also! Call for Last Minute Specials! We do not rent to anyone under the age of 25. Absolutely no smoking or pets!